Do your friends and family pester you to help them redecorate their home? Have you found yourself being asked again and again if you can help someone you know stage their residence prior to putting it up for sale? 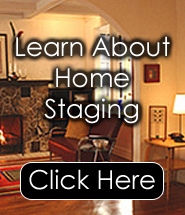 Then you may seriously want to consider your own home staging company. Let’s face it, you have the knack and you love doing it. So why should you do it for free? Why not join Decorate-Redecorate and the others who are starting or running their own home staging companies and turn that hobby into a full or part time career? At Decorate-Redecorate you can find everything you need to become a home staging professional from a variety of courses, top-notch informative books, slides, even promotional post cards. These wonderful, affordable tools aren’t just for beginners either. If you already have your own home staging company, you can find a lot of great tools to help you kick-start your business as well. There are loads of helpful, money-making tips, skills and organizational ideas that will help you to put your business over-the-top, and start bringing in more money and customers. Each course is tailor-made to fit your needs. For example, in the bronze course, you choose the training you need that will best fit your knowledge, experience, and resources. At the other end of the spectrum, the diamond course is designed to not only teach you all of the basic information you will need in restaging or decorating a house, but it also gives you all of the advanced training you are likely to ever want or need, as well. Stop making money for someone else. It is time for you to pocket all of the rewards for a job well done and begin your life living the dream you have always wished for. You spend a huge chunk of your life working. Why not enjoy what you do and keep the profits of your labors in your own bank account? The decorating and restaging business is waiting for you to start turning plain, ordinary homes into showplaces. So if you love to decorate, you owe it to yourself to take that innate talent and turn it into profit. Visit www.decorate-redecorate.com today to learn more. See why so many people have used the courses and tools offered to start or improve their home staging companies. You have nothing to lose and everything to gain, and the prices are so wonderfully affordable that you cannot afford to miss out on this opportunity!